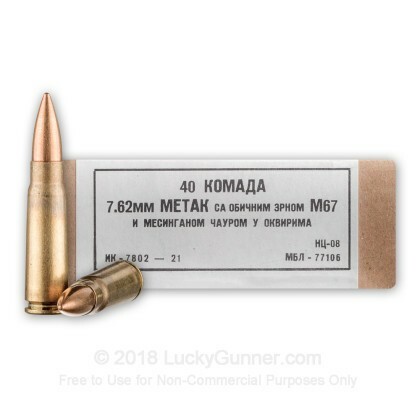 This 7.62x39mm military surplus ammunition was made in Yugoslavia. 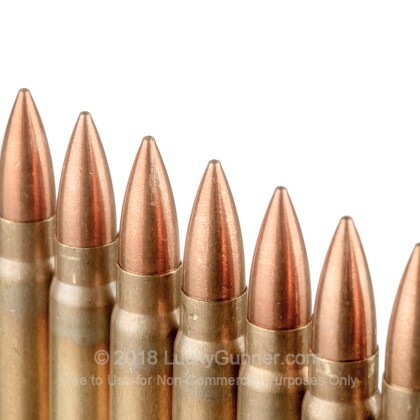 Since Yugoslavia is not longer a country (thanks to the Yugoslav Wars starting in the early 1990s) this surplus ammo is literally a piece of history, available to you. This ammo was made to Soviet military specifications. The brass cased round is loaded with a 123 grain FMJ round, and was loaded into 10 round stripper clips. This ammo is perfect for your "just-in-case" ammo supply, and make affordable range training ammunition. This ammo comes packed in a wooden create, which is great for long term storage for you ammo, and can be kept as a collector's item! This ammo does not have a steel core and is fine for indoor range training. Bear in mind, this ammo is slightly corrosive, so make sure you clean after firing. It is also Berdan-primed, so reloading this ammo is not easily done. 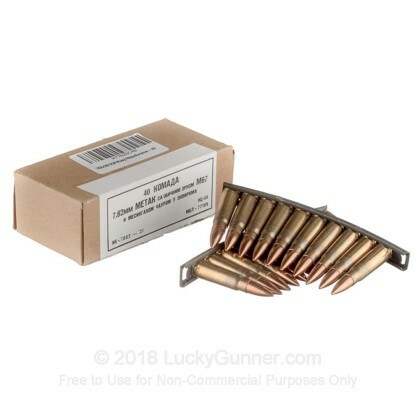 Order as much of this ammo as you can, before it runs out. For the price u can't go wrong and a nice wood crate that comes with it.. It's a little dirty but let's face it most of us love our firearms and after a good range day we clean them anyways I'm a right..the stripper clips worked flawless.. It was unreal how fast the shipment got to me. Great deal, the shoot good and have had no miss fires out of 300 fired so far. Second case of this ammo from Lucky Gunner. Good value, good price. Shot a practical rifle course at Front Sight with this ammo and had on failures. Kept me gun clean and the corrosive primers were no big deal. Looking forward to another case. Fastest shipping I've ever experienced! I ordered it at 11:00 am and it was delivered before 10:00 am next morning, unbelievable! Quality seems good, military create is pretty cool also. Haven't fired any of it yet but from the other reviews posted, i'm not a bit worried. Thanks Lucky Gunner!! Shot up about 400 rounds with my brother and our SKS 59s'. No miss fires. Having the rounds on stripper clips was nice. No problems with ordering from "Lucky Gunner". Good ammo and good company to deal with. And a very cool wooden ammo box for later use. I've bought several cases of this ammo over the last couple years and have never had a problem with it. No corrosion on the bright and shiny brass, no duds and is always on target. The strippers are a nice bonus when shooting my SKS. 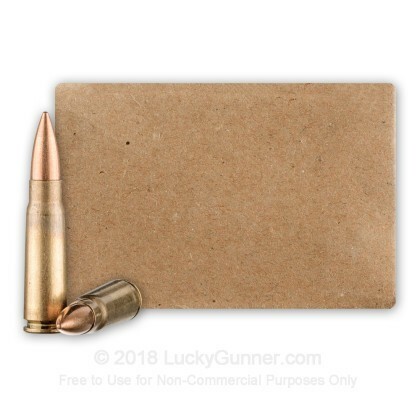 It's probably one of the best surplus ammo deals around. This ammo is outstanding and I will definitely buy more! I've used this ammo before. Hits touch at 50 yards. I'm working on 100 yards. Cleaning is needed after firing these because they are corrosive. Great service and quick shipping. I received my order of Yugo "in green crate" about 10 minutes after I ordered it. It was more like a day or two but seemed like almost immediately at a good price based on the going rate for same. You can't ask for any better service. Sure, I would like to see it cheaper both product and shipping but that is not an issue with LuckyGunner who did a great job with my order. As a caveat, I have not shot any of it yet but look forward to doing so. Thank you. I am very happy with this ammo and the price I paid. It arrived the very next day after my order was placed. Lucky Gunner called me to confirm my address before shipping. Ammo came sealed in wooden crate with wire locks, inside the ammo is sealed in tin with a rip cord to open it. The ammo grouped well out of my 10.5" barrel; 5 shot group at 25yards with a 4moa red dot produced 3 rounds touching with 4 being covered with a 50 cent piece and 1 flyer. After that I just started smiling and shooting until I ran out of the 3 boxes I brought into the range. 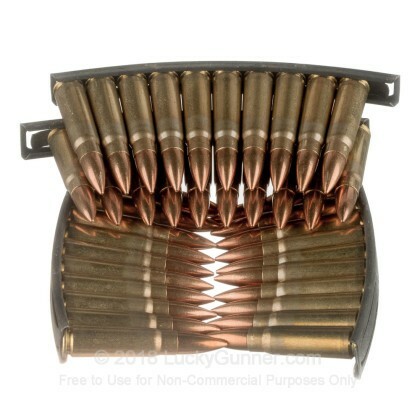 This is awesome lead core brass cased ammo for 7.62x39 weapons. However, it is very important to remember that it is corrosive and requires an extensive cleaning of any weapon after a trip to the range. With cheap AKs this might not be much of an issue, but a corroding parts on a custom SBR will make you cry. good ammo.... just clean your barrel !!!!! 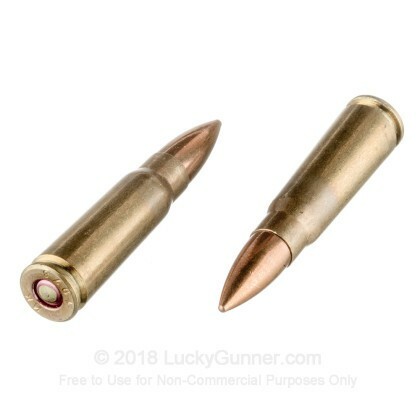 This Ammo is a must for those of us that have to have Brass in California. Please be advised, this Ammo is loaded super hot and is corrosive! You must clean your gun right after you use this ammunition. Other than that I would highly recommend! I have ordered many things from lucky gunner, and this ammo is very good! Plus, it ships very fast due to lucky gunner always shipping quickly! The ammo came in a wooden crate with two locking lugs and two hinges on the other side! Vaccum sealed inside! Primers are seated very well in laid just a bit (military specs) but not in laid too much! Brass cased, non steel projectile, and on stripper clips! Clean your gun after shooting, best ammo for an AK-47 variant or SKS variant! This lil' green toy box comes with 112 SKS stripper clips and 1120 brass, lead and copper rounds of joy. From a Century Arms Yugo, I experienced 4" groups at 30 feet using the stock sights while not trying to be clinical about aim and shot placement. Reliable! No problems whatsoever. Keep those lil' green boxes and repurpose them; barter or sell the stripper clips if you have no need of them. Q: So can you confirm will the green wooden crate from the pictures ship with the ammo or not? The listing details implies it does however the Q&A say's NO. Also what is the shipping costs? A: Hello BP, The most recent shipment that we received did arrive with the green crates, so the ammunition will be shipped in those crates! A: Hello Eric! This ammunition is considered slightly corrosive, so keep that in mind after shooting so you do not run into issues. Q: Will this ammo attract a magnet? A: Hello Sergei, Thank you for reaching out to us about that ammunition. This ammunition does not contain steel and will not be attracted to a magnet!